A common IT worker in computer related conversation spews more acronyms than a Soviet Commissar, but chances are he or she won’t be able to decipher half of them. Managers often don’t even know the meaning of the concepts that the acronyms represent. Some acronyms are meaningless by design and recursive to boot. GNU? GNU’s Not Unix! Others seem like acronyms, but aren’t. I always thought that TWAIN stood for “Technology Without An Interesting Name”, but it turns out it originates from “The Ballad of East and West” – “and never the twain shall meet”. Sometimes when I try to reinstall my scanner for the hundred’s time it seems to be very appropriate. Some apparently stood for something at some point in time, but then lost their meaning. People understood COM to stand for “Common Object Model”, then “Component Object Model” and now it stands for that old difficult technology that only Don Box used to completely understand. You need to use .NET instead, which is an acronym looking non-acronym which stands for whatever Microsoft wants it to stand for. Now Expect Trouble. Never Edit Text. Next Exciting Technology. What is the dot for? Come on, every developer knows that dots make your code more powerful. An acronym that is often used in conversations about Microsoft is “FUD”. It always made me think of Elmer Fudd (because people using it often sounded like him), but it’s actually a term coined by a computing pioneer, Dr. Gene Amdahl. It stands for “Fear, Uncertainty and Doubt” – tactics that IBM salesmen used against Dr. Amdahl’s company. Amdahl made mainframes that were fully compatible with IBM’s, but cheaper and faster. It’s easy to use FUD on managers that were in charge of purchasing those multimillion dollar big irons. “Nobody was ever fired for going with IBM”, right? The sheer existence of Amdahl was a huge boon to mainframe purchasing customers. 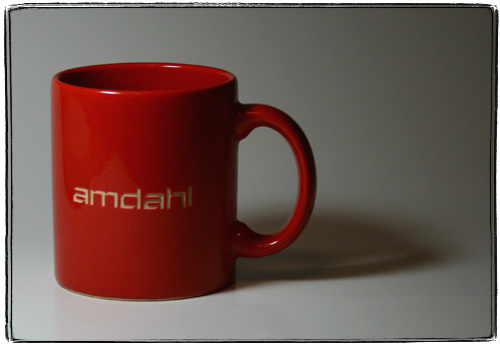 The rumor was that if you placed an Amdahl mug on your table, IBM salespeople were gonna give you million dollar discounts.